February 16 & 17, 2010 (Tuesday and Wednesday), 9:30am-3:30pm, $110. Pastel Still Life Workshop with Pottery. 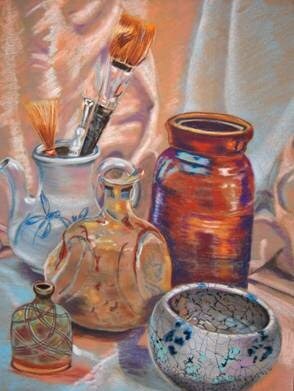 Students will work from a still life of pottery as well as a photo of the still life creating a painting in pastels. A variety of pastel sticks and pencils may be used on a neutral colored Canson paper. Design and composition will be covered in this first time workshop in pastels. This is a great opportunity to try out that box of pastels. The workshop is designed for all levels of learning.